(NaturalNews) Many modern-day chemotherapy chemicals are derivatives of mustard gas chemical weapons used in World War I. The Nazis got their hands on the technology, and through chemical / pharma companies such as Bayer (whose co-director was convicted of crimes against humanity in the Nuremburg trials), they managed to create "chemotherapy drugs" which are still used today. Chemotherapy's No. 1 side effect is cancer. Even if it shrinks one tumor, it causes permanent damage to the brain, kidneys and liver while igniting thousands of other micro-tumors throughout the body. The reason chemotherapy is used by the cancer industry is because it results in repeat business. Chemotherapy actually "backfires" and causes health cells to feed the growth of cancer tumors. One group of scientists accidentally exposed the total fraud of chemotherapy when they were trying to research its effectiveness on treating tumors. They found that chemotherapy causes healthy cells to release a protein that fuels cancerous tumor growth, thereby ensuring repeat cancer tumors (and thus repeat business for cancer clinics). Cancer clinics need not show ANY positive results from their treatments. If a patient dies from the chemo, everyone says they "died of cancer." If the patient lives, they are heralded as a "cancer survivor," after which they have a 95% chance of the chemo causing new cancers, resulting in yet more revenues for the cancer centers. No cancer center blames patient deaths on the poisons being dripped into their veins. Oncologists are fully aware of all this. 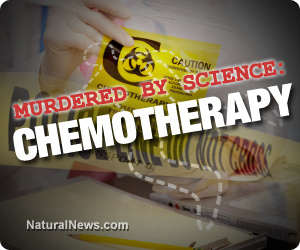 Most refuse to undergo chemotherapy themselves, but they gladly diagnose patients with cancer then sell them chemotherapy drugs at obscene markups, pocketing the profits while poisoning their patients. Conventional cancer treatment centers are the closest thing to "Nazi chemical torture camps" that exist in the world today. Oncologists knowingly and willfully prey upon the ignorance of their patients in order to poison them (or kill them) while generating hundreds of thousands of dollars in profit for themselves. There is no scientific evidence whatsoever that says chemotherapy cures cancer. The idea that it "shrinks tumors" is also scientifically irrelevant, given that tumors contain cancer stem cells that grow back with a vengeance. Shrinking a tumor is not a sign of an effective treatment. Most cancer patients could be literally cured of their disease by ending their exposure to common carcinogens (food, smoking, environmental chemicals, fluoride, etc.) and greatly boosting their intake of vitamin D, broccoli juice, garlic, pomegranate, omega-3 oils and other anti-cancer superfoods. This is article #7 in our "murdered by science" special report. Click here to continue with #8.